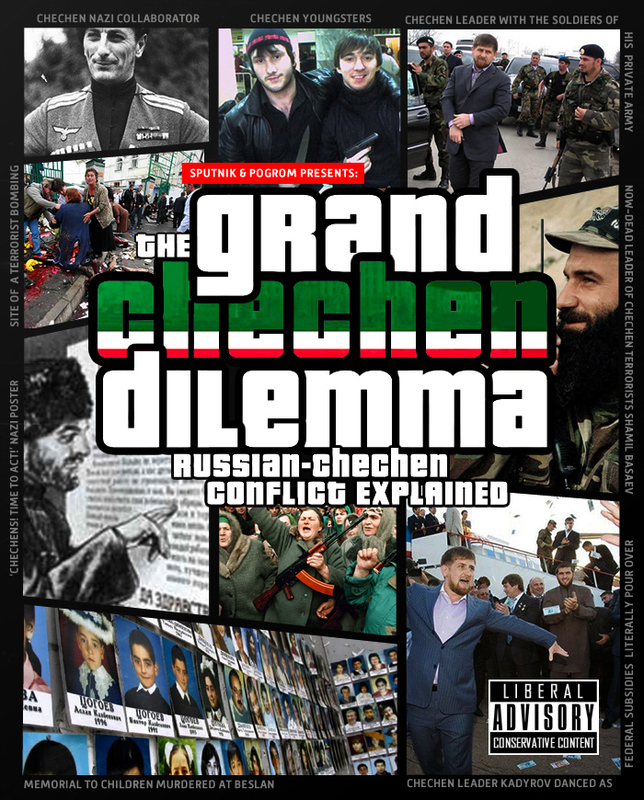 ince the horrific Boston bombings brought forward the murky and delicate topic of Chechnya to the top of numerous online discussions, independent Russian conservative blog Sputnik & Pogrom decided to compile a short list of answers to the most frequently asked questions with respect to the issue of Russian-Chechen relations. Chechnya is a region in Southern Russia. Geographically, it includes two very different parts, mountainous areas and flat country. Historically, nomadic Chechen tribes populated the mountainous portion, while the flat country for centuries was home to a multitude of settled Slavic and Caucasus peoples. Here lived ethnic Russians, Armenians, as well as Jews and even Greeks. The present capital of Chechnya, the city of Grozny (the name itself means ‘menacing’ or ‘formidable one’ in Russian), was founded as a Russian outpost by Cossacks. During the Soviet times, the Cossacks were resettled out of Chechnya, and decades later, in the early 1990s local radicals expelled Russians, Armenians, Jews, and other non-Chechens. According to witness accounts, expulsion was as dire, inhumane, and cruel as it comes. Today, it is still not possible to dig up information about this time, as Chechen and federal authorities fear that if all of the facts of the great atrocities were revealed, it would warrant investigations and trials against them. According to what we are allowed to know, as many as 200,000 non-Chechen civilians, most of them ethnic Russians, simply ‘disappeared’ untraceably in the early 1990s for good. If documentation or proof were at hand, any expert would classify this as ethnic cleansing. Understanding this exhaustively elucidates the nature of the modern-day highly inimical relationship between Russians and Chechens. How would you feel about those who made 200,000 of your own people ‘disappear’? 2. What was at the root of the Russian-Chechen conflict? It all began with Georgia’s voluntary entry into the Russian Empire. Subsequently, the need arose for transport network expansion in the region. Chechen tribes saw an opportunity to profit from robbing wagon trains, which eventually led to the merchant operation’s near collapse and presented a significant threat to Georgia’s security and economy. To save Georgia, the Tsar sent military squadrons to combat the attacks, which inflamed the Chechens even more. Criminal activity, amid the rise of Muridism, a radical Islamic ‘liberation’ movement, transformed into a full-scale political operation, led by imam Shamil, who united all the Caucasus’ tribes into a sort of a totalitarian theocratic state. Russian generals successfully battled Shamil, ultimately leaving him with no external support and destroying what we now call the Islamofascist regime. To guarantee stability for all of the peoples living in the region, Cossacks, Russian cowboys, were sent to Chechnya to populate its flat country. Long-lasting peace was broken with the Communist revolution, when the Cossacks were announced as ‘anti-Soviet agents’. They were expelled by Communists, and their lands were illegally redistributed to the Chechens. The Chechens’ gratefulness to the Soviets knew no bounds. They fought at the side of the Nazis during World War II, and they even offered a beautiful white stallion with a golden harness as a symbol of loyalty to Hitler. Their collaboration with the Nazis was the main reason behind Joseph Stalin’s decision to deport Chechens to the Kazakh steppe following World War II. In the 1990s, when they managed to return to Chechnya, a ‘fight for freedom and independence’ began. Strangely enough, the main adversaries of the Chechen ‘freedom fighters’ initially were thousands of ethnic non-Chechen civilians. According to existing information at the time, hundreds of thousands vanished in what one could call the most atrocious act of genocide. The violence has escalated ever since through the resurrection of imam Shamil’s Islamofascist ideas. Numerous terrorist acts were conducted against the ‘Russian oppressors’. Do you recall the notorious 1999 apartment bombings in Buynaksk, Moscow, and Volgodonsk that killed 293, the 2002 Moscow theatre siege that killed 170, the 2004 Beslan school hostage crisis that resulted in the deaths of 370 children, the explosions in the Moscow metro in 2010 that resulted in 88 dead, or the explosions in the Moscow airport in 2011 that killed 37 dead? These were all carried out by Chechen terrorists. 3. Everything is OK now, right? Unfortunately, things are far from OK. Having essentially failed in the course of the First and Second Chechen military campaigns, federal authorities put the state’s indivisibility principle above everything else and decided to ‘tame’ local elites by sending insane amounts of money to them and offering de facto judicial impunity to Chechen leader Ramzan Kadyrov and his immediate staff. Backed by his omnipotent private army, Kadyrov managed to build a cryptic nation state, and, having accumulated a goliathic financial lot from the downpour of federal subsidies and loans, he is rumored to be impatiently waiting for the most opportune moment to secede Chechnya from Russia and proclaim its long-dreamed independence. As for the endless chain of terrorist acts routinely occurring in Chechnya and neighboring republics almost daily, those are ’razborkas‘, or fierce internecine weeding out of North Caucasian clans. The whole affair is naturally viewed with extreme displeasure in ‘mainland’ Russia, as it evokes parallels to the times of the Golden Horde yoke, when Slavic princes were forced to render tribute to the Mongolians busy partying hard somewhere afar. 4. So, lavish gifts from Moscow are basically reciprocated with terrorist acts and insulting squandering? Correct. Persistent militant and radical Islamist ethics seem to have cauterized the notion of humility, and modern day Chechnya, judging by the various manifests published on numerous extremist websites, professes the ideas of unbound entitlement and permissiveness. «Allah gives money to us,» Chechen leader Ramzan Kadyrov said with complete seriousness in 2011, commenting on the structure of the local budget. This is, by the way, 95% covered by Russian federal subsidies. 5. What do Russians want, then? Detach Chechnya. Russians, both liberal and conservative, do not need it and do not want it. Unlike President Vladimir Putin, who enjoys the image of ‘The Great Tamer of the Caucasus’ (However, at what price!) and puts the state’s indivisibility principle above the nation’s well-being, we would be happy to have nothing to do with this violent, volatile, and paradoxically tax-sponsored region that is populated with people who sincerely hate us. Since our authorities just will not let Chechnya be, we pray each day that someone will exonerate us from its burden. 6. In a nutshell, what is your point? If, say, the United States came to occupy Grozny today, the entirety of Russia would celebrate by waving American flags everywhere tomorrow. If you enjoyed this article, please consider donating. Thank you!